The Swiss Panerai PAM 163 is a very unique special edition Panerai Radiomir Chronograph made for the F series (2003-2004 production year) in only 230 pieces. There are many details about this watch which make it a very unique and interesting novelty in the Panerai catalog. This watch is powered by the extremely rare Valjoux manual winding column wheel chronograph movement with date indication, Valjoux 234 Caliber. In 2003, leading up to the release of the PAM 163, Panerai still had not released their in-house movements nor did they have their own manufacture, so it was not out of the ordinary for Panerai to feature rare and esoteric new old stock movements in their novelty special edition watches. Panerai reserved their Panerai Radiomir Watches series watches to showcase discontinued and limited production movements. Because of the rarity and difficulty in these movement, the Radiomir Special Edition watches were released as ‘Novelty Watches’ in very low production numbers and as such, were typically met with great demand and eager anticipation. Through the E series (2002-2003 production years), Panerai had already featured the Lemania CHT 15 in the Zerograph, the Chezard 7400 in the dead seconds Independent, the Omega 920 in the Seconds Counter, the Girard-Perregaux 9907 in the 3 Bridges Tourbillon, the Frederic Piguet 6850 in the Platinum Big Date, the Venus Calibre 179 in the split seconds chronograph, and of course the Rolex Calibre 618 to power the venerable PAM 21. Interestingly, all of these Radiomir watches featured precious metal cases in white gold or platinum and were made in case sizes of either 42mm or in the case of the PAM 21, 48mm. So it came as a huge surprise when Panerai released the PAM 163 which featured a stainless steel Radiomir case and on top of that, a new Radiomir case size in 44mm. The one thing that remained constant in this Radiomir Novelty was the esoteric movement Panerai chose to power this watch. Panerai chose the Valjoux 234 Calibre manual winding chronograph to power the PAM 163. The 234 Calibre is a movement from the 1970’s that was used in very few watches. This movement is a manual winding, column wheel chronograph with a date indication-a rarity for the time it was produced. This made it among the most expensive chronograph movements of its time and this is probably why it was used in so few watches. Even more unique, this movement has a quick set date adjust feature. It’s not quick-set like the modern quick-set watches that we are all familiar with, rather the quick set date adjustment is engaged by advancing the hour hands past 12:00 twice so that date advances, going to just past 2:00 and then rewinding the hour hand to just before 10. If you continue to toggle the hour hand between (al little before) 10 and (just a bit past) 2, each time you past 12:00 the date will advance without having to go all the way around the dial twice. This was Valjoux’s version of the quick set date adjustment and was considered state of the art ‘haute horology’ for its time period. 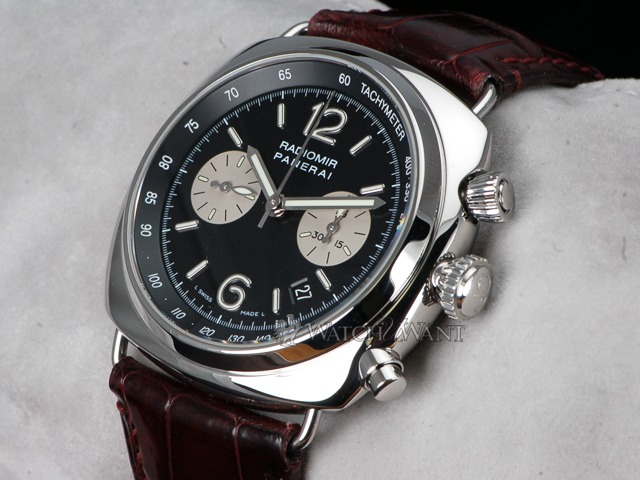 One of the most interesting anomalies of this watch is the very peculiar set of chronograph pushers. The Chronograph pusher at 2:00 is recessed into the case and has a collar which screws down into the recessed hole in the case preventing this pusher from being depressed. You can understand how this would prevent unwanted use of the chronograph while underwater and that is precisely how many watch manufacturers have designed their chronograph pushers with this collar locking system. But why only on 1 chronograph pusher and not the other. The other chronograph pusher at 4:00 is a traditional plunger style pusher and this button serves to reset the chronograph when the chronograph is not running. But there is nothing to prevent the depressing of this button. Why wouldn’t Panerai have designed this pusher with the same collar locking system? There is no explanation or reasoning that was ever shared with the Panerai enthusiasts’ community to explain what inspired or prompted the design or the use of these pushers. There was speculation that these pushers were legacy from the original design of the movement but These peculiar pusher sets were not used on any other watches which used the same Valjoux 234 Calibre movement. The final anomaly of this watch is the case that Panerai decided to use which was a strict 1 off case size, never to be used before or since the release of the PAM 163. The PAM 163 is housed in a 44mm stainless steel Radiomir case. Interestingly, this is the 1 and only 44mm Radiomir case ever produced by Panerai. All other Panerai cases are either 40mm, 42mm, 45mm, 47mm or 48mm and no other Panerai has ever featured the peculiar mismatched set of chronograph pushers.